Have you come across a file where all you can hear is inaudible chatter or even total silence? These files should be reported to the admin team as they don’t require captioning. 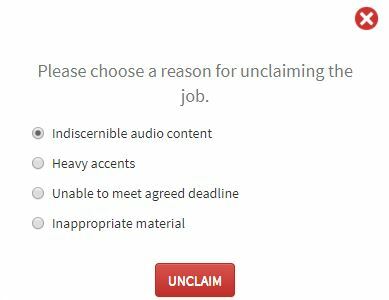 If you’ve claimed the file already, go into your My Work tab and Unclaim the file, citing Bad Audio as the reason for your unclaim. We recommend that you preview all files before you claim them on the portal. You can preview a file by clicking ‘View’ next to the Claim Job button in the Find Work tab. Once in the preview window, you can report a bad audio file by clicking – Blank Audio – under the categories. This will automatically report the file to our admin team. Make sure you click through the whole file and listen closely to the audio before marking a file as blank – sometimes there will be a little bit of chatter at the beginning or end of the file, but there is still some captionable content somewhere in there. The audio quality and volume can also vary between files, so make sure you’re listening closely before reporting a file as blank. Struggling with audio quality? 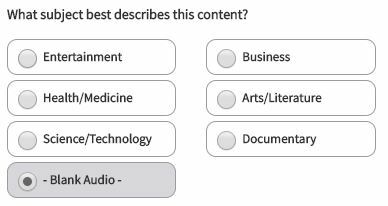 The Recorded Captioning Style Guide has some guidelines on how to deal with difficult files.